Last summer, I meet and worked with Nir Eyal. Eyal is a Stanford professor and graduate, owner and content creator of Nirandfar.com, and the author of Hooked. For those not familiar with lean strategy, the Hooked Model fits with it hand and glove. Both methods help narrow down many ideas to one. This drives more effective iteractions on a product or solution, therefore resulting in a more effective product. 3) why those aspects of your product are habit forming. 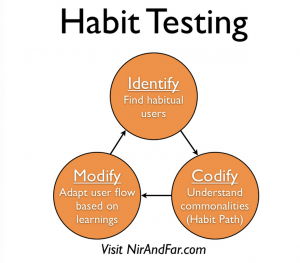 The chart below should help you to better understand the Habit Testing process. Unlike lean strategy, the Hooked Model ensures habits are reinforced as the product developes. Eyal uses the an analogy between Vitamins and Painkillers to illustrate this idea in his YouTube video, Hooked: The Psychology of How Products Engage Us. “W product becomes so important that it becomes a habit,” says Eyal; there is a need created. This need isn’t necessarily a physical need or survival need, but more of an itch the consumer wants to scratch. Let’s say you’re waiting to hear about a job while sitting in a class. All of a sudden you see a notification that you have a new e-mail, but you can’t read it. That’s the itch: you want to check the e-mail, but you can’t. A habit is when not doing something causes you pain. That’s when you know you’re hooked! Eyal continues to explain that there are good habits, like showering and brushing your teeth. However, the significance of the Hooked Model is to leverage the customer behavior and pain they feel if they do not use your product. Hopefully this model will prove helpful as you brainstorm and create your next product. Keep in mind that while you want to gain customers immediately to raise awareness and demand about your product, it’s also important to keep in mind how you plan to retain those customers long-term – good luck! This entry was posted in Product Management and tagged Carolyn Spencer, Engagement, Habit, Hooked Model, Nir Eyal, Product Development, Products, UI/UX. Bookmark the permalink.